After speaking on EKON 2014 and ItDevCon 2014, the last month has been extremely busy on both the work and family side of things. So it took longer to write my review of the Delphi Cookbook by Daniele Teti, Packt publishing (ISBN 978-1783559586). The Amazon page for Delphi Cookbook has a Look Inside option to view about 80 pages. 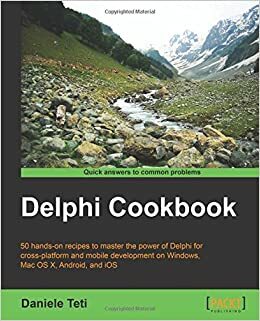 The Packt page for Delphi Cookbook has a Free Sample option to view about 70 pages, and a code listing download (which also contains the errata). Daniele Teti has a Table of Contents on the page where he introduced his book, but that ToC is a bit poorly formatted, so I included a better formatted one below. Simon Stuart: OTAPI – Book Review – Delphi Cookbook by Daniele Teti. David Millington: Review: Delphi Cookbook by Daniele Teti. Before the review a disclaimer. I bought the eBook version before Packt publishing asked for reviewers. They sent me a paper copy for free (which somehow took 2 weeks to arrive). I read about 25% of the book before the two European Delphi conferences, and the rest over the last two weeks. Writing style: most of it is very pleasantly and encouraging to read. I want to stress the last: Daniele Teti did an excellent job on this. When writing a book or teaching material, it is hard to strike balances between the kinds and diversity of topics, the depth and order of the topics, and choosing between what to cover and how to cover it. The way the chapters a built together with a variety of interesting topics per chapter, a great mix of chapters, and the various topics building (but not too much relying) on previously covered topics is really great. The whole book shows that Daniele is a great teacher. Well done. The first chapter has a few VCL topics that could have been explained better. I have the feeling those were the initial writing chapters, and Daniele and the reviewers were still settling down on a routine. Shortly after that, the book gets much much better: like hearing Daniele doing a talk on a conference. Especially in the eBook, the code is poorly formatted. There are enough tools to to a properly formatted example code export from Delphi, so this should have been done much better. There is still a quite a bit of non-English idiom and sentence structure in the book. This can be distracting. The reviewers and editors should have done a better job on this. Even though explaining SQL injection, the book does not talk about any other kinds of injection. Since there are many examples of clients and servers passing parameters by strings, there is virtually no error checking. This is bad, as exactly those kinds of parameter passing can make for very vulnerable applications. I know this is a trade off: so few pages, to much to cover. But still (: Maybe Daniele finds time to write a series of blog posts on the “there’s more” portion. Way too few programmers value the try..finally construct (Delphi, C#, and many other languages) so this should be the cornerstone of every resource cleanup example. I didn’t buy the book by accident: knowing the presentation and teaching style of Daniele, I was expecting a nice mix of topics explained in a light and fun way. The book surpassed those expectations by far. So any Delphi programmer should buy this book. If not for using right now, then for getting some ideas, and reading the various topics later. Below some suggested combinations for using this book various Delphi audiences. The free German Delphi Starter book from Delphi-Treff (yes, Germany is not the primary language for a lot of you, but this book is very well written) which covers covers introductory topics in a very nice pace. The paid Delphi XE2 Foundations by Chris Rolliston. The free Delphi Essentials eBook by Marco Cantù. Though more than a decade all, it is still a good book for starters. By now you can get the electronic version of the book at CodeCentral. Buy this book. 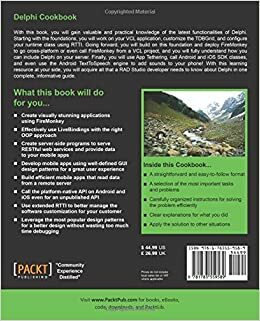 Consider buying Coding in Delphi by Nick Hodges. 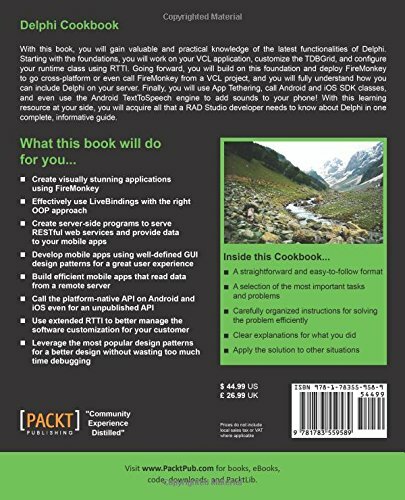 Also read Coding in Delphi by Nick Hodges. I know few people that master all Delphi topics well (I’m not one of them: especially on the mobile side I’ve still a lot to learn). Even for gurus, I think this is a nice book, especially considering the price. This entry was posted on 2014/12/01 at 12:00	and is filed under Delphi, Delphi XE, Delphi XE2, Delphi XE3, Delphi XE4, Delphi XE5, Delphi XE6, Delphi XE7, Development, Software Development. You can follow any responses to this entry through the RSS 2.0 feed. You can leave a response, or trackback from your own site. Thanks for that link. And the compliment. You write: “Cleanup without doing try..finally: Way too many programmers value …”. Shouldn’t this read “way too few” or “not enough”?